Week 5 is in the books! That means less than 30 to go! We had a really good week and even managed to go to a school event! 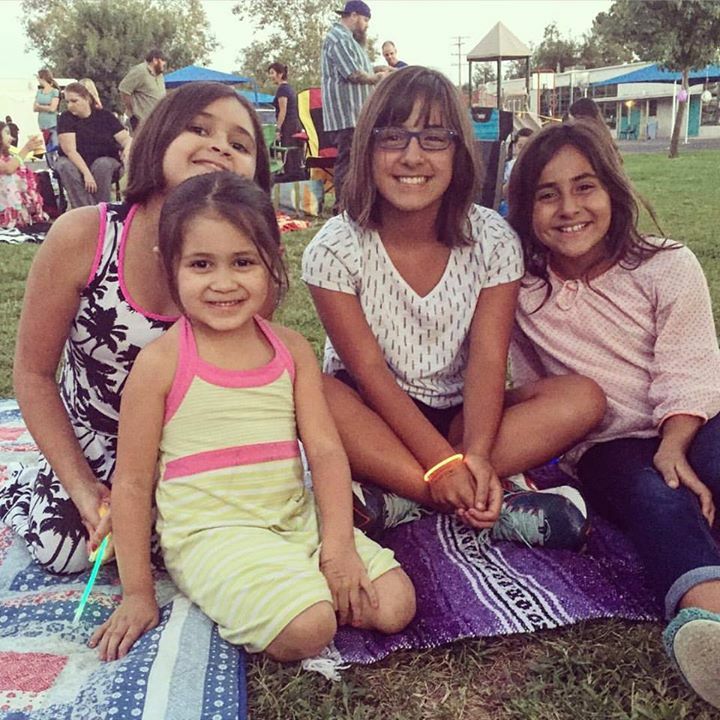 On Friday the school put on an outdoor movie. We pulled out the big picnic blanket and got to watch The Little Rascals and we got to sit with our super cool friends Ava and Sophia! 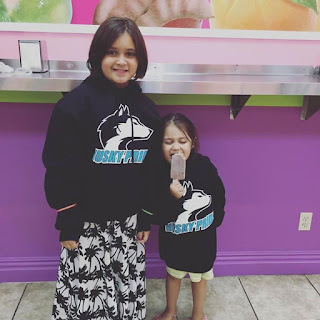 Afterwards we noticed they were selling some school gear for a great price so we got both girls a sweatshirt. I remember getting my elementary school sweatshirt and loving it! And I still wear my high school one! Language Arts: This week's letter was "Aa". This one was a bit easier for her to write but as usual it was hard to get her to remember the name of the letter. She is okay with the letter sounds but the names just won't stick. She got her first set of grades back and she got a 2 on her letter recognition. (Don't even get me started on this 1-4 scale!) I think it's time to start flashcards with her. Besides the worksheets we played some games, watched some videos and Louie and Poppa went on an "Aa" hunt around the house. We also reviewed syllables and counting words in a sentence. Reading: This week we talked about the info you can on the front cover, back cover and title page of a non-fiction book. Of course I saved this one for the last minute and so we looked at books on Amazon. Of course I also read to her. We have been reading from the complete book of Star Wars characters. 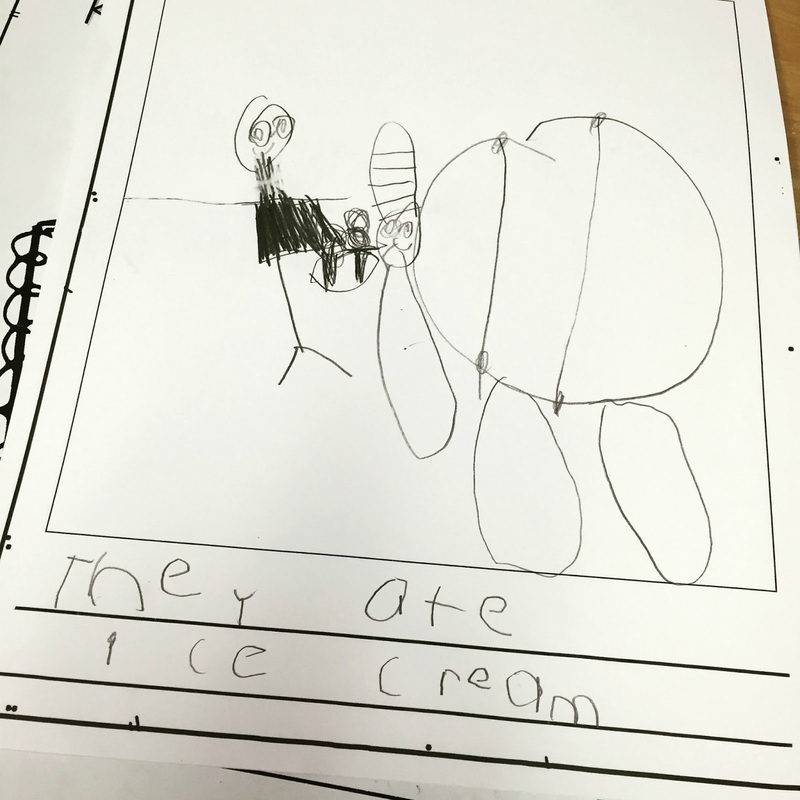 Writing: For writing this week we focused on more details of writing. One day we looked at a character's clothes. I asked Louie to pick a character in her story and we talked about what that character would wear. She choose Elephant and apparently he always wears a top hat and suspenders. I think he looks smashing! On another day we talked about zooming in on a character. So we "put on" our binoculars and zoomed in on the character Cat. Cat likes to have fun ZOOM Cat likes to play games ZOOM Cat likes to play bingo. Math: This week was all about 5! We looked at counting objects in a picture. She put together a cute book where she counted the animals in the picture. We also played number matching game. 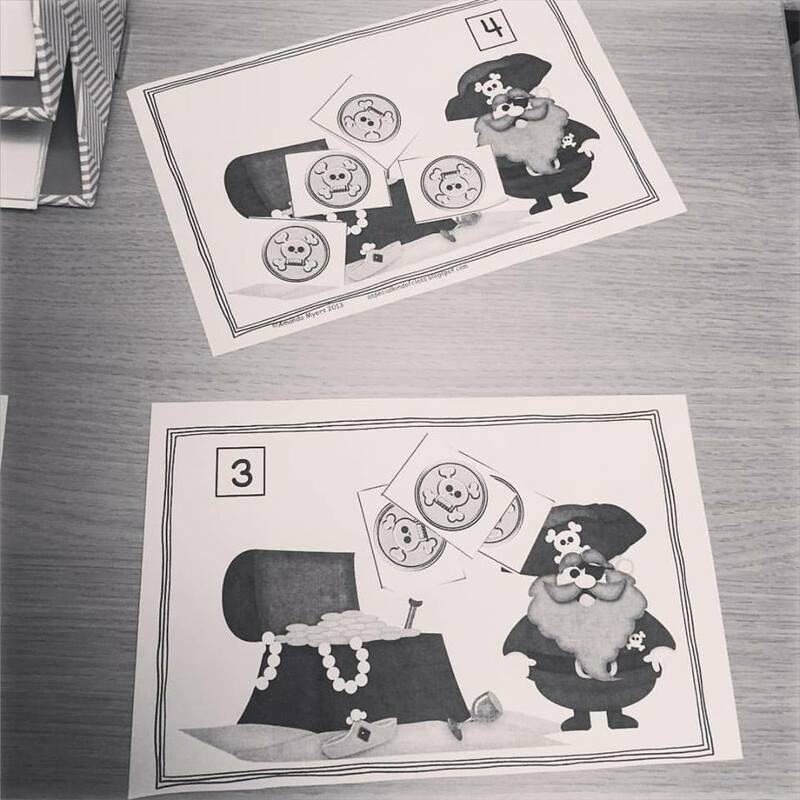 She also had to pay up to a bunch of pirates this week by counting out gold coins. 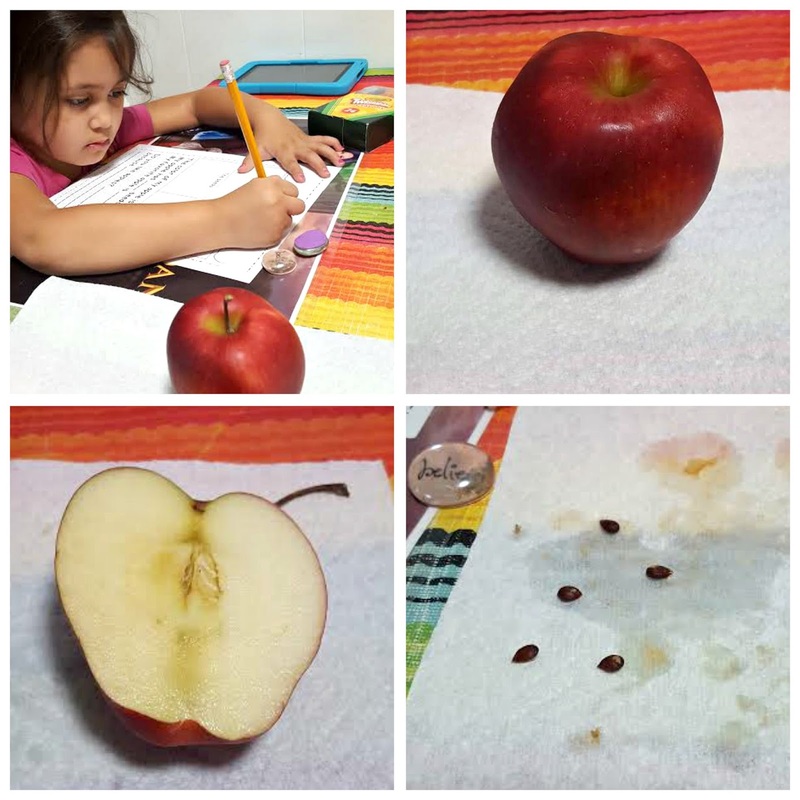 Science: To tie into social studies this week for science Louie studied apples. We talked about all the colors they come in. We talked about how they grow on trees. We asked Jessica from work to tell us about her favorite apple recipe. Louie labeled the parts on an apple and even got to dissect one with Poppa. As as a tie in to math there were 5 seeds! Phi had a pretty light week since she turned in her state report and was a week ahead of the rest of her class. Language Arts: Before starting a new novel Phi had to write an opinion essay about the book "Hatchet" by Gary Paulsen. Her writing skills are getting a lot better. She did a spider web outline for a 5 paragraph essay with 3 book quotes included. She took that and wrote a rough draft that we edited together. Then she typed it up, edited a few more times and printed a final draft. It's a great paper! 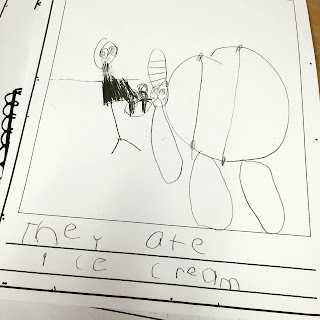 She also had to draw a book cover . We have also some great grammar worksheets that the teacher has been sending home. Each sheet has about 6 questions and reviews a lot of different types of grammar. Love them! Math: THE POWER OF 10! Now I am imagining the number 10 with a cape! We looked at the pattern of 0 and how exponents work. With math it seems like sometimes she gets it and then when we try to take that concept and use it for real-life like math problems it gets confusing for her. This week our worksheet was about Phone Troubles. It used exponents to try to figure out if a person had enough memory on his phone to download some new music. Very realistic. Social Studies: WEEK OFF! YEA! Science: We looked at the difference between vascular and nonvascular plants. To bring the point to life Phi did the Celery Lab Experiment. 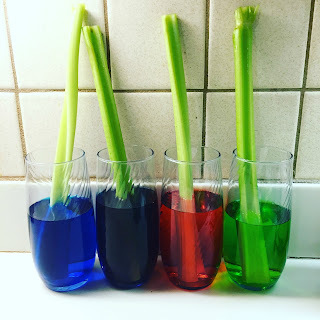 We have all seen the celery in the colored water project. We did this to look at how vascular plant use xylem and phloem to carry water through a plant. It was a nice week and we are looking forward to whatever week 6 brings!